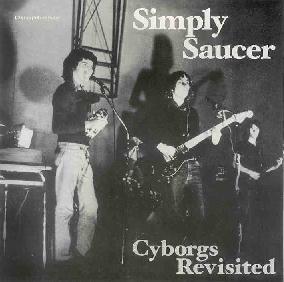 Simply Saucer - "Cyborgs Revisited"
During their existence, Hamilton, Ontario's Simply Saucer only released one 45rpm single in 1978, and a full album was only available years later when Bruce Mowat, the owner of a Hamilton record store released it on vinyl in 1989. Named after Pink Floyd's "Saucerful Of Secrets" album, Simply Saucer were, at the core, a garage rock band that had far more in common with the Stooges, Velvet Underground, and classic cosmic Krautrock than they did with the Floyd. Cyborgs Revisited consists of the 9 tracks from the 1989 LP, plus 9 additional tracks compiled from rehearsal and live material from 1977-78, plus the two sides of their lone single. I didn't know what to expect when I first played the CD. "Instant Pleasure" is the opening track and starts off as a raw garage rock tune with a catchy melody. But it quickly kicks into a rockin freakout blitz with the alien space electronics that make this such a stunning combination of garage rock and Kosmiche music. Ditto for "Electro Rock". We start off with the song, and then the band blasts off into the cosmos, thrashing and bashing like a Stooges assault, but also incorporating a mindbending acid space jam. The swirling synths, driving rhythms, and cosmic acid guitars, all within a song-oriented garage rock framework, demonstrate just how different Simply Saucer were. "Bullet Proof Nothing" bears strong similarities to the Velvet Underground but with a thrashier garage rock feel. "Dance The Mutation" is similar but has a throbbing spaced out Stoner vibe. "Mole Machine" is less song-oriented and more of a pure space-garage jam. Taken together, "Here Come The Cyborgs" parts 1 & 2 are over 10 minutes, with part 2 sounding like David Bowie circa Ziggy Stardust, laced with an extra dose of thrash rock and alien synths, plus a Bluesy freeform space jam section. And "Illegal Bodies" is a 10 minute jam that highlights what this incredible band could accomplish when given the opportunity to stretch out. While there's some good music to be heard on the bonus tracks, and valuable in terms of tracing the bands evolution, it's the first half of the CD that showcase Simply Saucer's unique blend of down n dirty garage rock and tripped out space electronics. There are some excellent garage-psych tunes, and other tracks get into somewhat more mainstream garage rock, with more Blues rock elements and the spacey stuff largely left behind. "Get My Thrills" reminded me of a garage-psych version of the Dead's "Truckin". The songs from the bands single release have better production than much of the album, with "I Can Change My Mind" having the usual Simply Saucer garage sound but with more polish, while "She's A Dog" is a bit of a bubblegum song with cool raw guitars. In summary, some of the most unique and progressive bands have been in danger of being lost to history were it not for labels like Sonic Unyon who have had the foresight to reissue these gems and document their existence. Space rockers and Krautrock fans... this may well be THE reissue album of the year.